While carbonara recipes usually use bacon, I don’t like all of the unhealthy grease from it so I prefer to use ham or prosciutto. I also include more vegetables in this carbonara recipe. I had zucchini that I needed to use up, but you can also use broccoli instead. Use plenty of olive oil so the noodles do not stick! 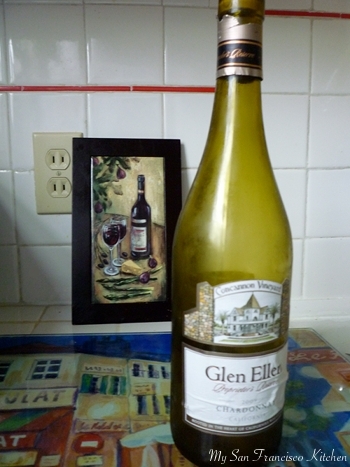 Bring a pot of water to boil, and add 1 tbsp olive oil. 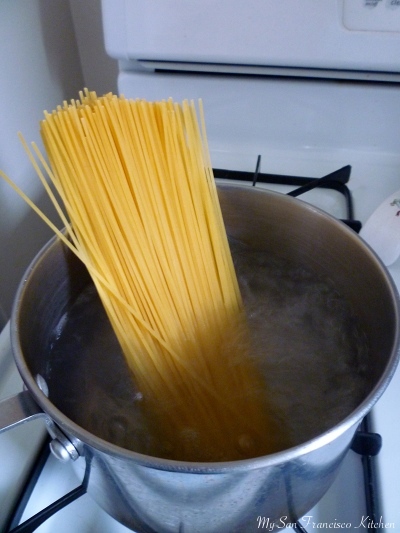 Cook spaghetti noodles al dente. Drain, then set aside. Heat 2 tbsp olive oil over medium heat in a skillet. 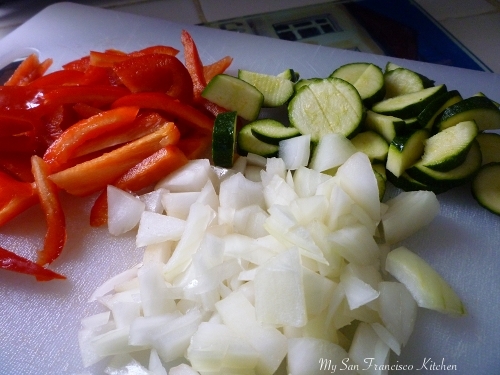 Chop onion, bell pepper, and zucchini. 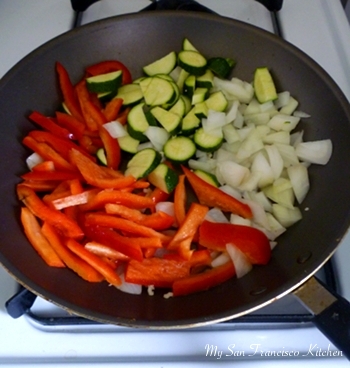 Add vegetables and minced garlic to heated oil in skillet. Let simmer 15 minutes, stirring occasionally. Add prosciutto and dry white wine and stir. Let simmer 5 minutes. Toss noodles into skillet and stir vegetables. Add extra olive oil if this is not easy. Add pepper. Beat 3 eggs and pour over noodle mixture in skillet. Continuously toss noodles to mix egg over medium high heat. 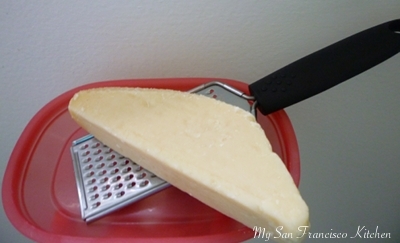 Add Parmesan cheese in 2 half portions, mixing into noodles each time. Stir everything together well, then serve. 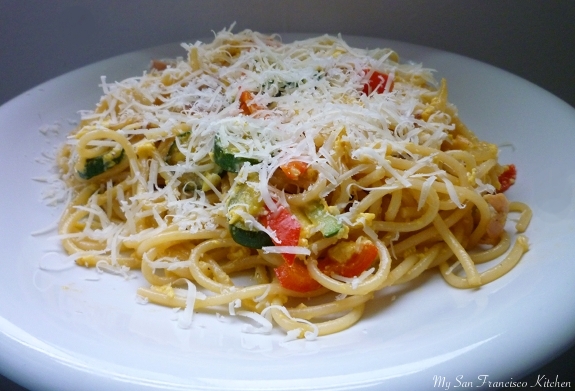 This entry was posted in Dinner, Italian, Lunch and tagged carbonara, prosciutto, spaghetti. The ingredients sound great, particularly the addition of the zucchini. However the technique is different from any pasta carbonara recipe I’ve read. I think the pasta needs to stay hot, not cooled with water, and the egg mixture rapidly stirred into the hot pasta, to cook the eggs without scrambling them. Maybe I misread your recipe, because I did see you wrote to add the noodles to the skillet, but I think they need to be really hot to cook the eggs right. 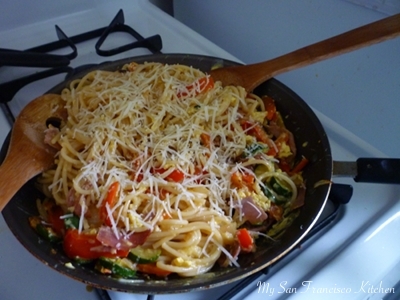 I’d add the other ingredients after the egg and pasta are mixed. But that’s just me. I’ll try it your way! I think that is such a great point, I updated the recipe to reflect the change. I am so used to cooling the noodles so they stop cooking right away, but in this case it makes sense for them to be hot when you add the egg. Thanks for the great tip!